Potatoes are undoubtedly among our very favorite vegetables to grow. There’s nothing quite so satisfying as unearthing those tantalizing tubers! There are a number of ways you can grow them – each with its own specific advantages. 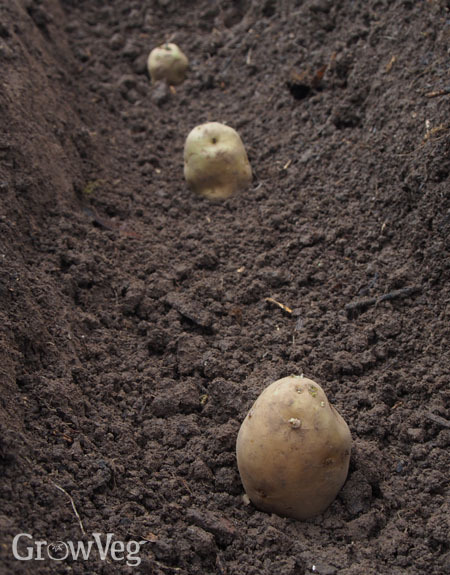 The traditional and arguably most productive way to grow potatoes is in parallel rows. This makes them easy to hill as they grow using any combination of surrounding soil and organic matter such as dried leaves, well-rotted manure or grass clippings. You can also tickle some chicken manure pellets or other slow-released organic fertilizer into the bottom of the planting trench. All those organic nutrients will help to nourish the hungry plants as they grow. Hilling increases the amount of organic matter around the roots so there’s more space for the tubers to grow. It also prevents any that grow near the surface from turning green. Start hilling once the shoots are up to your ankle, then continue drawing up or laying down material every few weeks until the foliage has filled out between the rows or you can hill no more. Who doesn’t love cheating the seasons to get a super-early crop? If you’ve got the protection of a greenhouse, hoop house or even a cold frame, you can. Pop them onto a four-inch (10cm) layer of potting soil then cover to a similar depth. They’re easily hilled up – just add more potting soil every time the foliage reaches about six inches (15cm high) and keep on going till you reach the top of the sack. Growing potatoes in containers or sacks also works at the other end of the growing season. Plant ‘second early’ varieties in late summer, then bring them under cover as the weather cools down to grow on. This way you can enjoy a really late crop to enjoy throughout the fall.